Producing corporate videos is a means of driving revenue and telling stories that is still the backbone of many businesses worldwide. There is often the need to show new employees what they will be doing on the job, produce company profiles that have a mission statement and proposition or create a slick one-off video to highlight a new product or service. Broadcast and online commercials are two of the ways in which corporations convey their image to potential customers, and let them know about their services. Event documentation videos can give the viewer an exciting first-person view of a large trade show, or another informational conference. These are just a few of the ways in which companies can reach out to the world, but when you are creating content like this, there are plenty of mistakes you can make along the way. It’s a fact that good music is critical to the success of a video, but there is a very delicate balance of volume, repetition editing, and equalization that will turn a great track into an even better storytelling device. Getting professional direction with music that supplements the video presentation instead of dominating the entire work is your desired effect. A well-known phrase in the industry is “sound is 70% of what you see.” Although this may not be an objectively provable thing, it does underscore the importance of a solid recording of anyone speaking on camera. From airplanes to tricky wardrobe to AC vents to loud clothing and jewelry, a professional audio mixer will be your best ally in getting great sounding audio in myriad scenarios. A company that uses multiple mics distributed to multiple discreet channels is only the first step in being able to walk away from the set with a “clean track.” Even if your presentation is for the web and not broadcast TV, a seasoned expert with a full kit is the best choice for audio for your story. There are, a multitude of corporate videos out there for nearly every industry. There are probably even some competitors with videos in your particular space. Finding a way to create a video that shines out above the rest is vital. 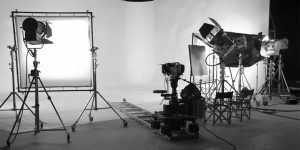 A solid video production company with gifted storytellers will be able to listen to your needs and create a custom solution that not only employs a vast array of ever-changing technologies but finds new avenues to get your message across in a unique way. “Leave them wanting more” is a common axiom and is never truer than in video work today. A great production company will be able to lead the way with a snappy, polished video that is engaging and memorable. Staying on brand is more important than ever, and a great video firm will have this as their number one goal. What is your product about, what are you about and most importantly, what is your whole company about? Asking these questions and identifying detailed answers is of utmost importance these days. Sometimes clients will see a trendy storytelling device being used or a song or palette that seems edgy and want to work it into the promotion of their product. It may work or it may not, but a solid production company with a strong pedigree in the business will be able to identify these trends and deliver a video that not only seems current but more importantly tells a story that is timeless… And when it comes to branding, what’s more, important than that?